Each seemed to have a serious flaw, each had hidden secrets behind closed doors. He dressed to the nines, and always had that superior look. If one brother had something he had to have the better thing. His weight was enormous and an ungainly, ugly and elephantine sight. Women flung themselves at him for he promised them a thrill. He had that look in his face that could cause a cold chill. A man who did not care for the family and wanted his brothers to fall. A man of laziness in both work and faith in heaven. Each blamed the other as their family went down the drain. Such is the nature of sin and the end results that one must pay. 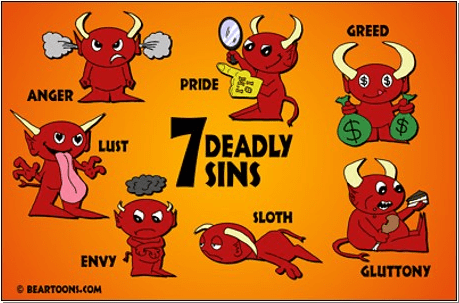 the seven sinswhich sin did you not do?